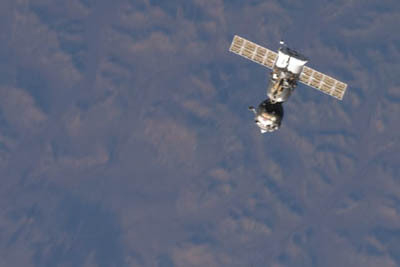 During final approach Friday, television views from the space station showed the Soyuz on final approach against the blue-and-white backdrop of Earth while a camera in the TMA-07M spacecraft showed the sprawling station against the black of deep space. There were no problems and about 10 minutes of docking, hooks and latches fully engaged to pull the Soyuz firmly into place. After extensive leak checks, Romanenko, Hadfield and Marshburn planned to open the forward hatch and float into the space station, welcomed by Expedition 34 commander Kevin Ford and Russian cosmonauts Evgeny Tarelkin and Oleg Novitskiy, who were launched to the lab complex Oct. 23.